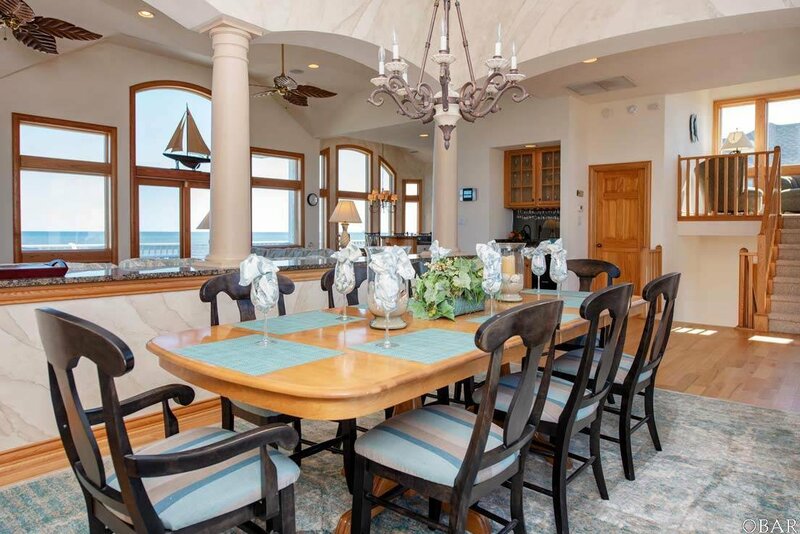 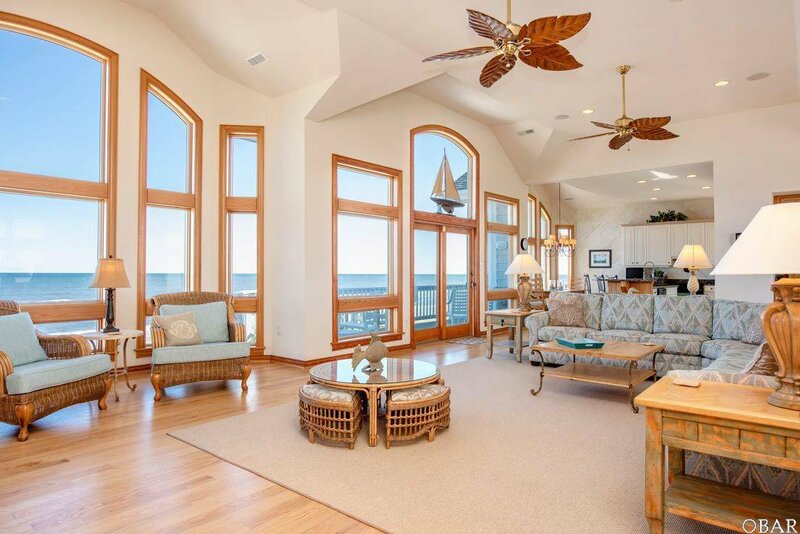 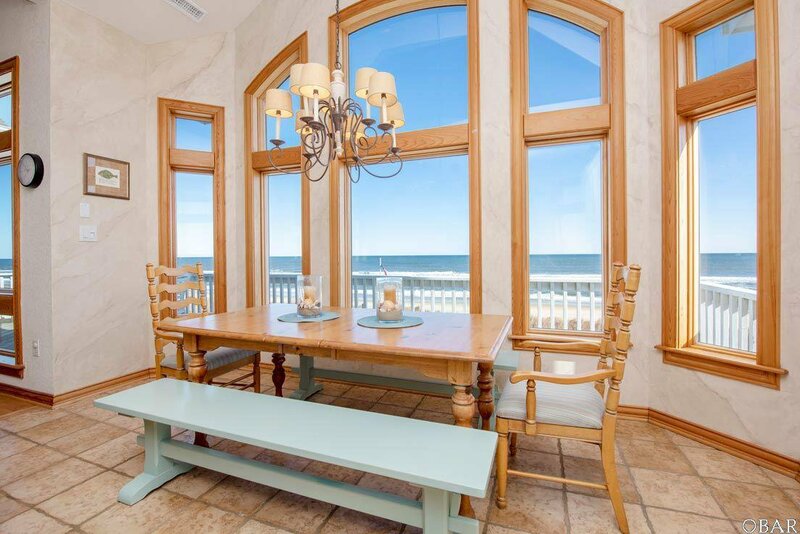 Pelicans Nest is a premium luxury oceanfront estate located in the prestigious community of Pine Island on the Northern Outer Banks of North Carolina. 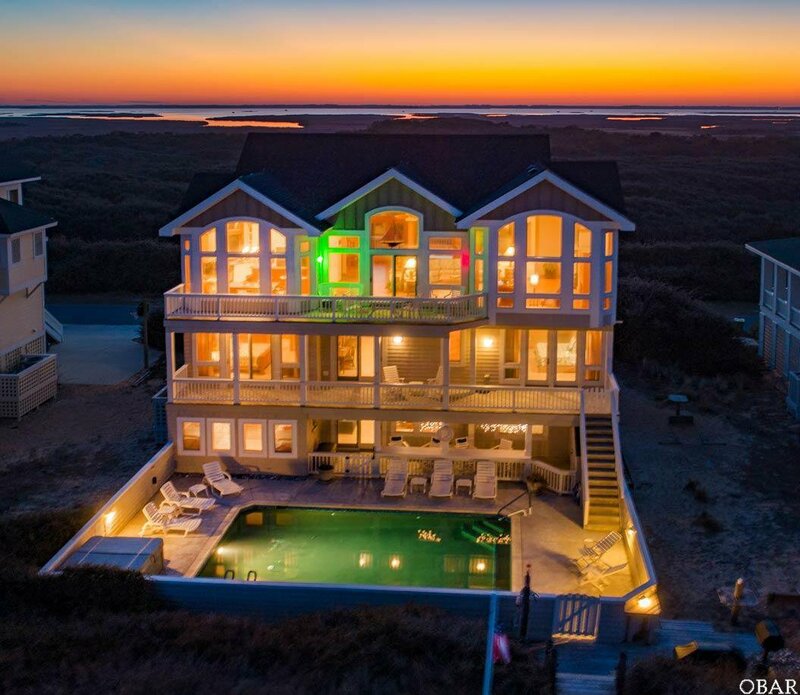 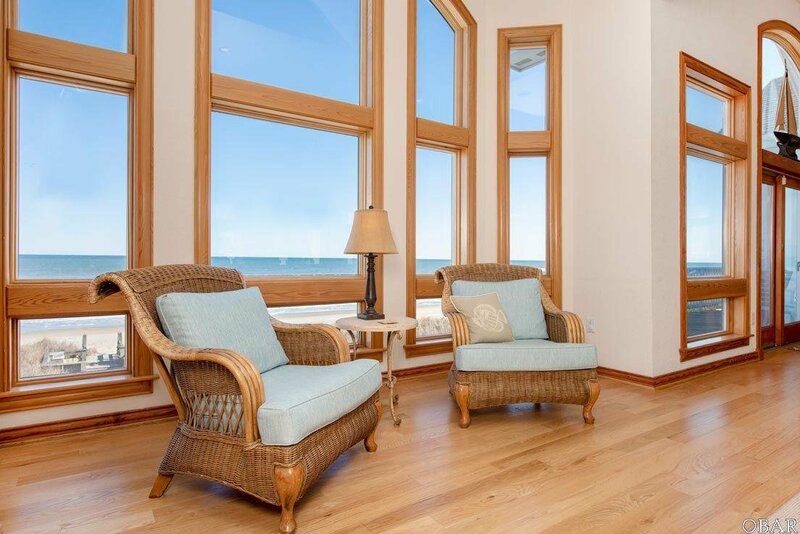 Situated on a one-of-a-kind elevated beach front parcel, it boasts some of the most dramatic views of the ocean and sound of ANY HOME ON THE Outer Banks. 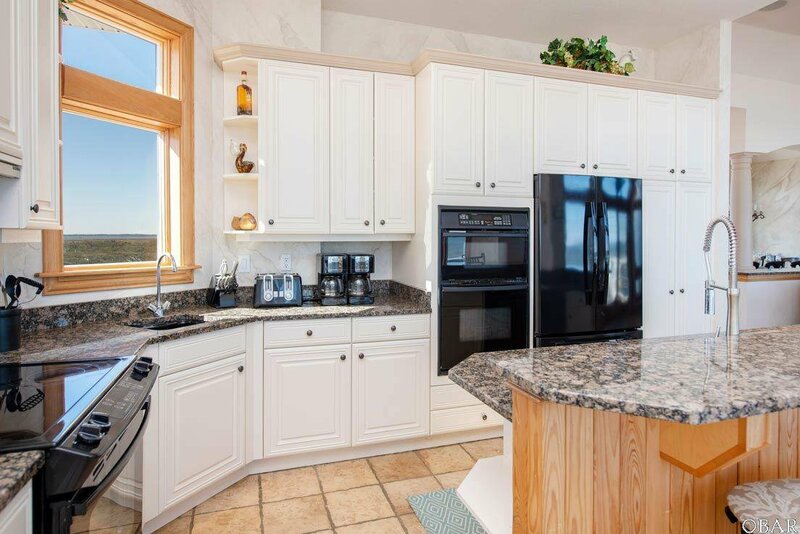 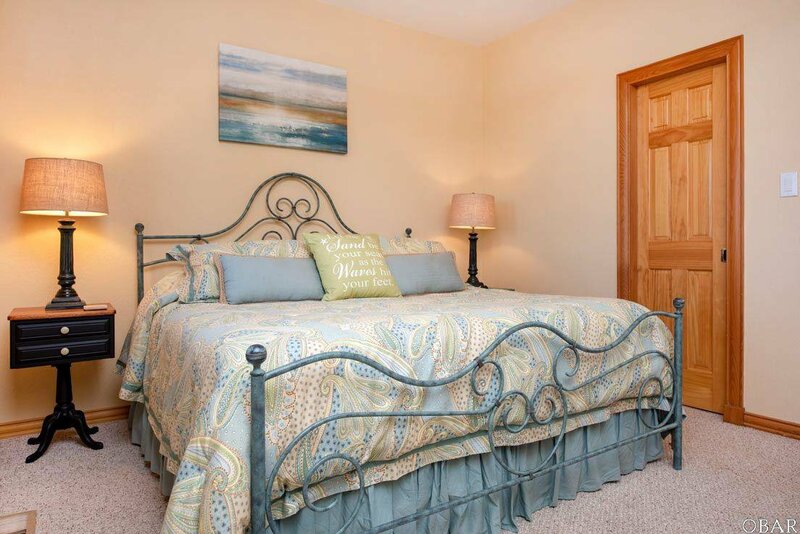 This one-of-a-kind home has been built and furnished with the finest quality materials and state-of-the art amenities. 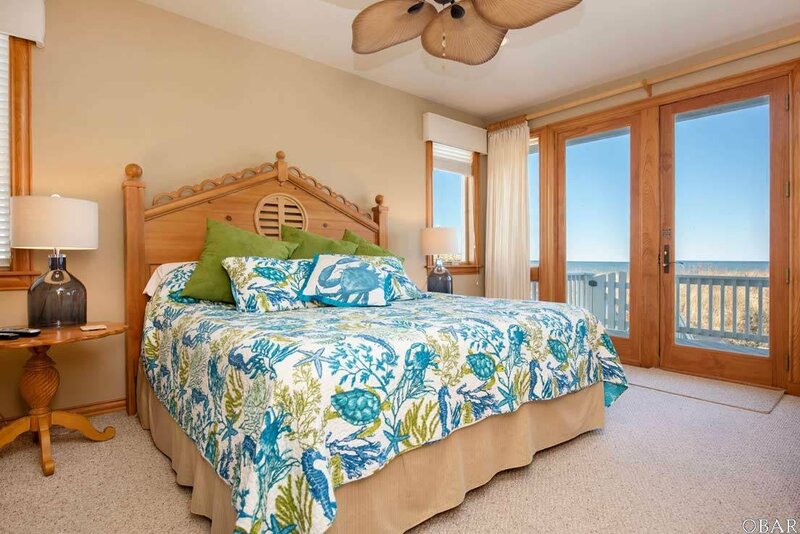 Pelican’s nest was designed to take in the incredible waterfront views from all of the main rooms in the home, from the sunrises on the ocean’s horizon to the sunsets over the sound. 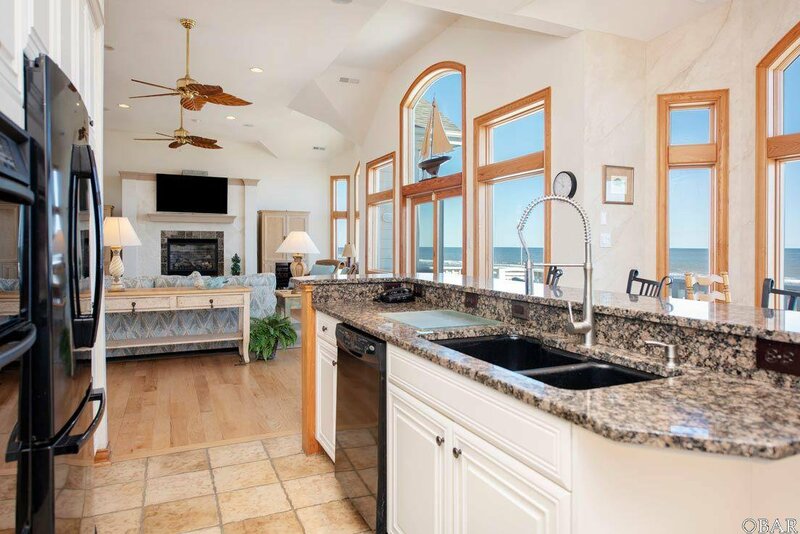 The timeless, clean-lined residence spans 4300 square feet with 6 bedrooms, 5 full baths and one half baths, including three sumptuous waterside masters. 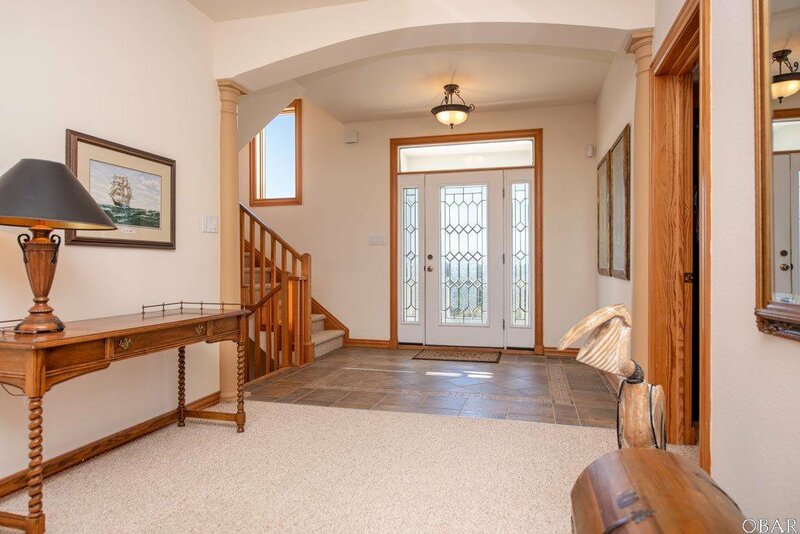 Through the mid-level foyer, you will find a quiet sitting area with access to the wide mid-level decks. 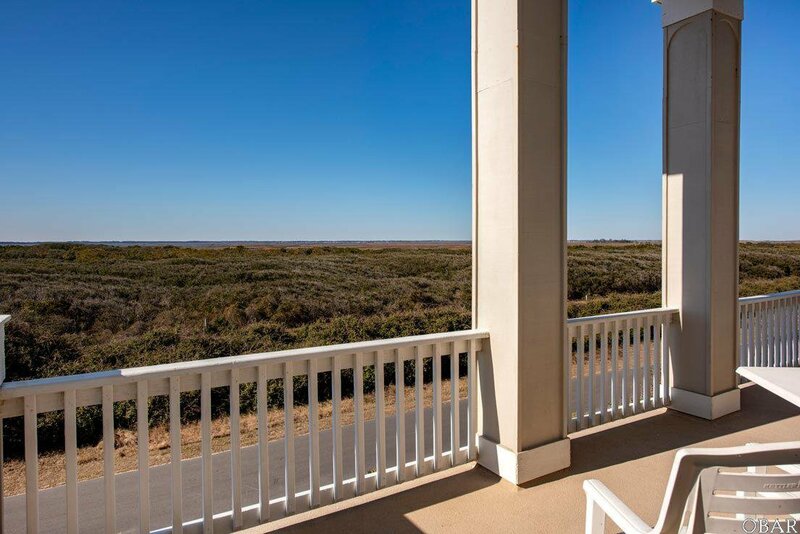 Most rooms of this home overlook the varying blues of the Atlantic to the east, and the serenity of the marsh and sound to the west. 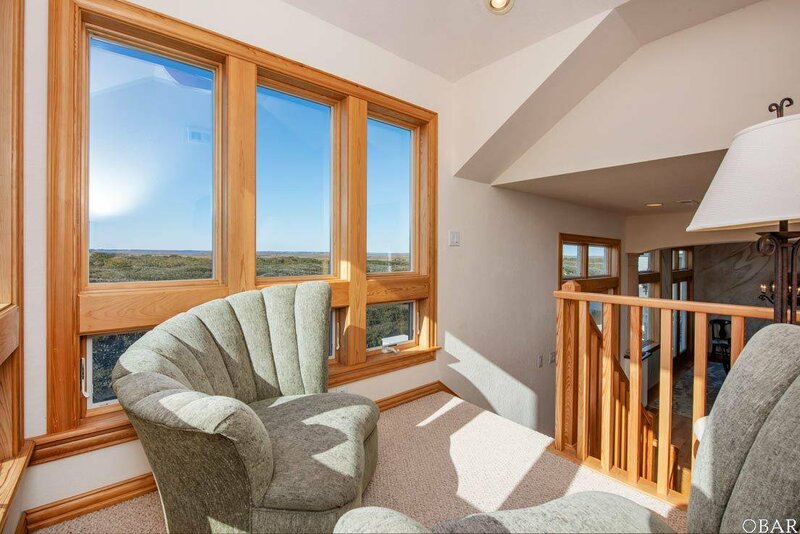 The living spaces feature hardwood floors, soaring ceilings and oversized doors and windows. 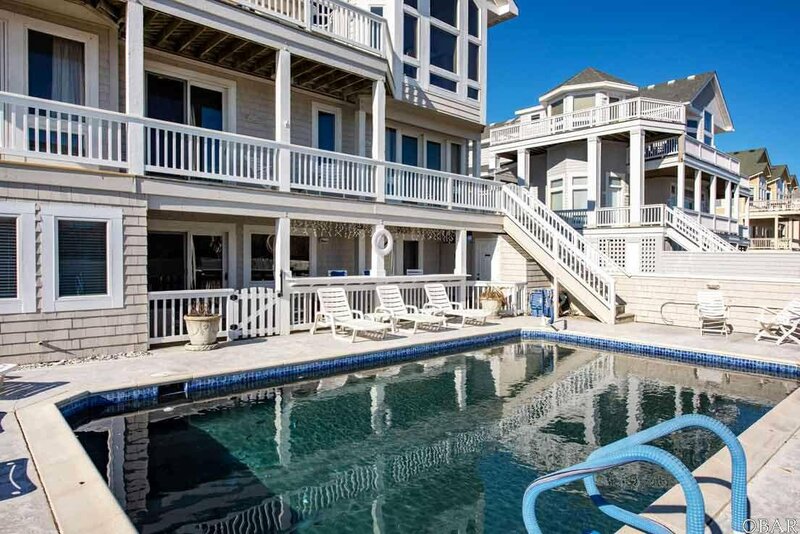 The resort-style outdoor living area takes in breezy covered porches, sun decks, a grand pool area with hot tub. 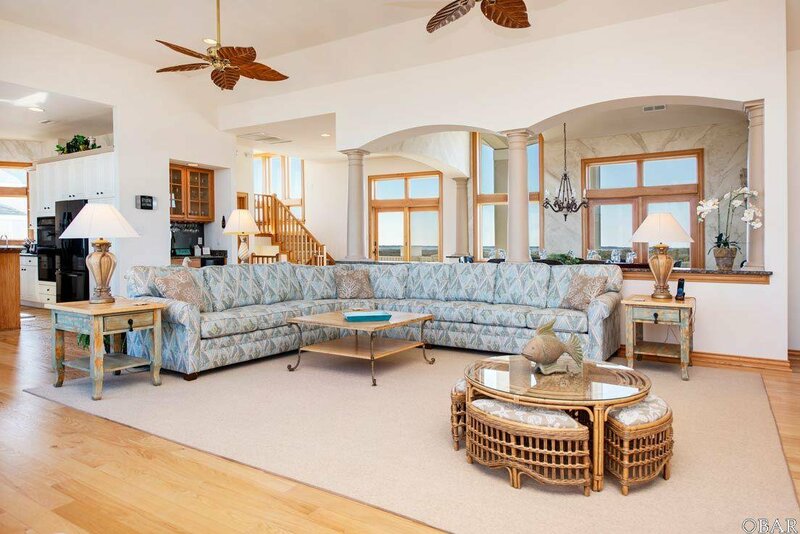 Walk upstairs to the great room, which dazzles with plenty of Carolina sunshine streaming the floor to ceiling windows accenting soft colors of the coastal décor.The lower level offers three bedrooms, two bathrooms, a game room, kitchenette, laundry room, and access to the pool area. 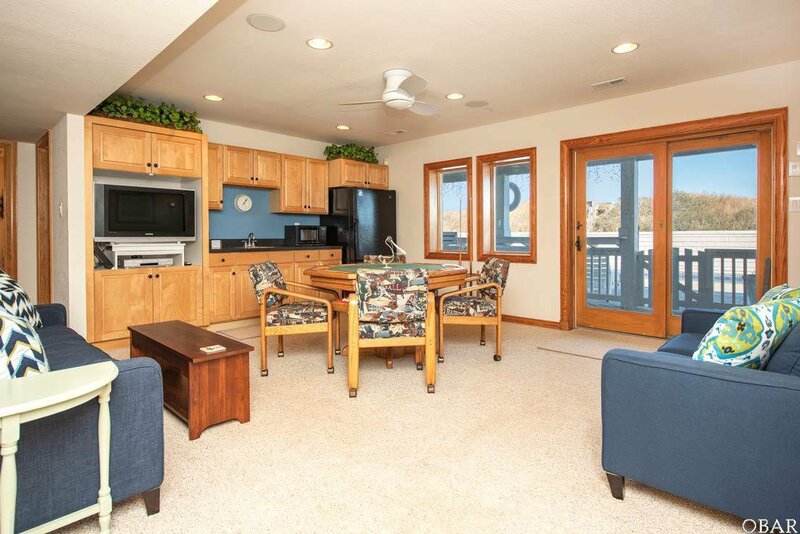 The electronics of the home are top of the line and feature a superb surround sound system. 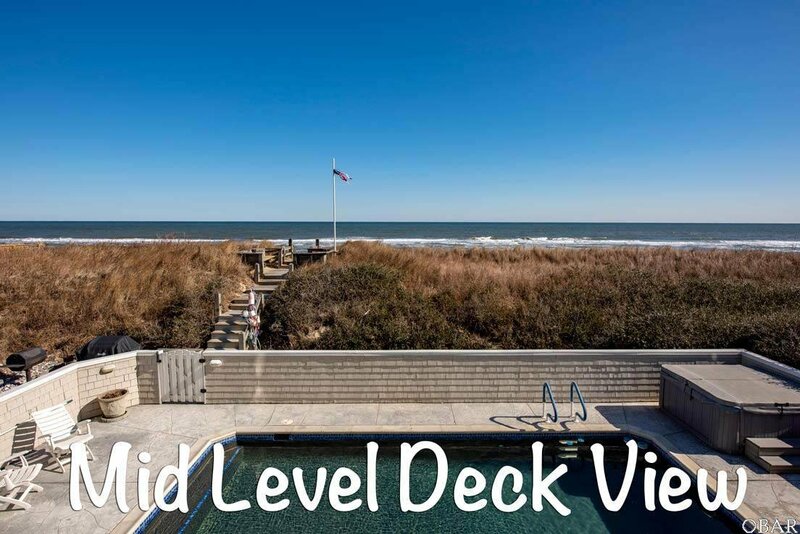 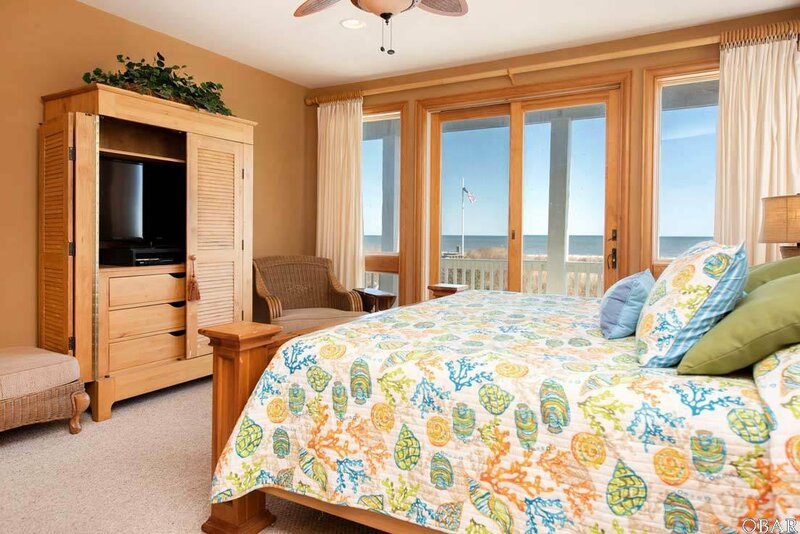 From the pool area, take a walk on the private boardwalk over the well-established dune to the beautiful beach or sit on the private dune deck and listen to the waves lapping. 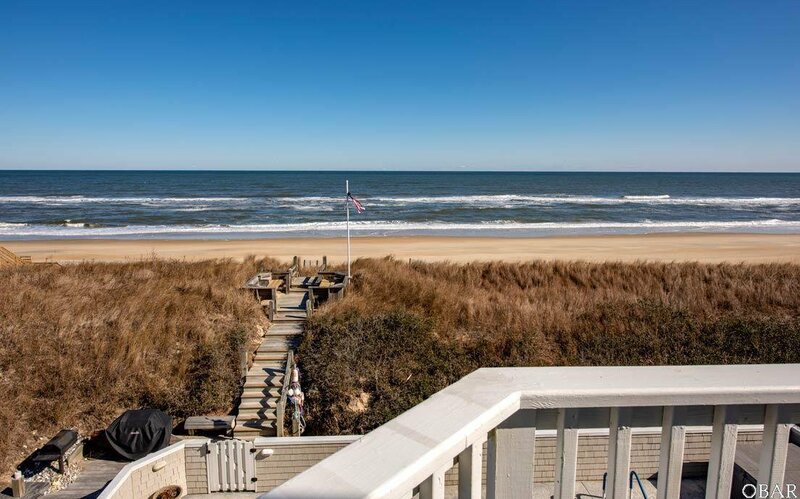 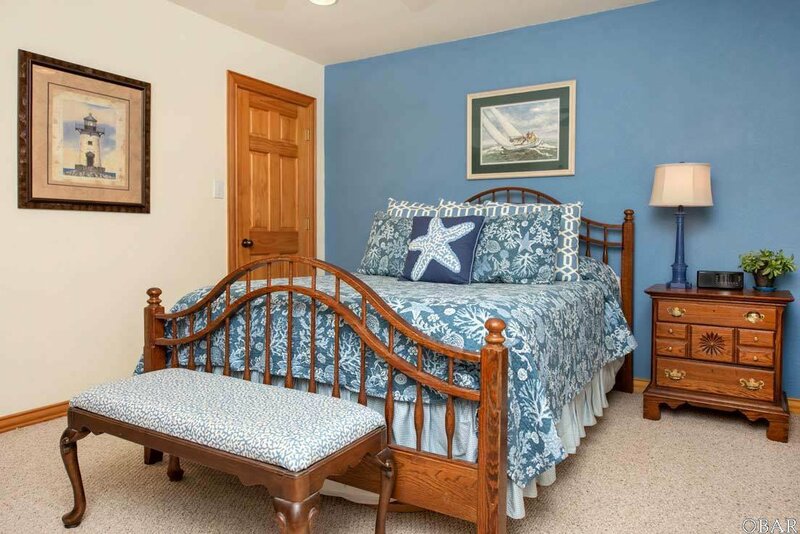 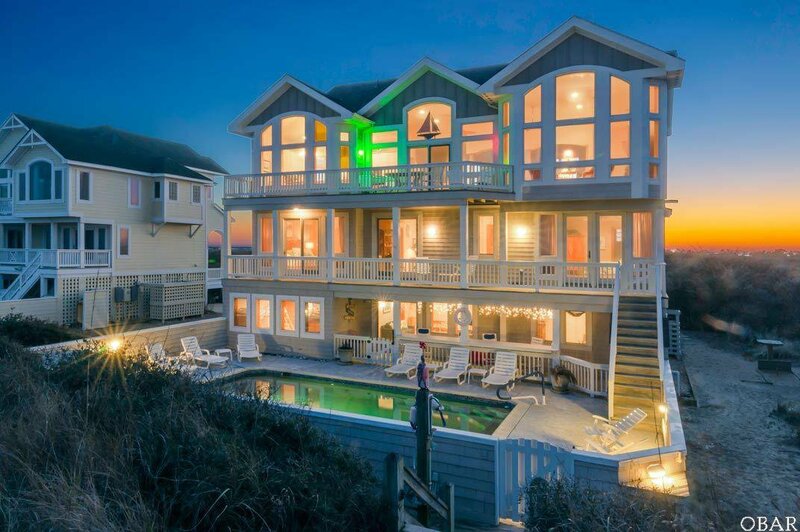 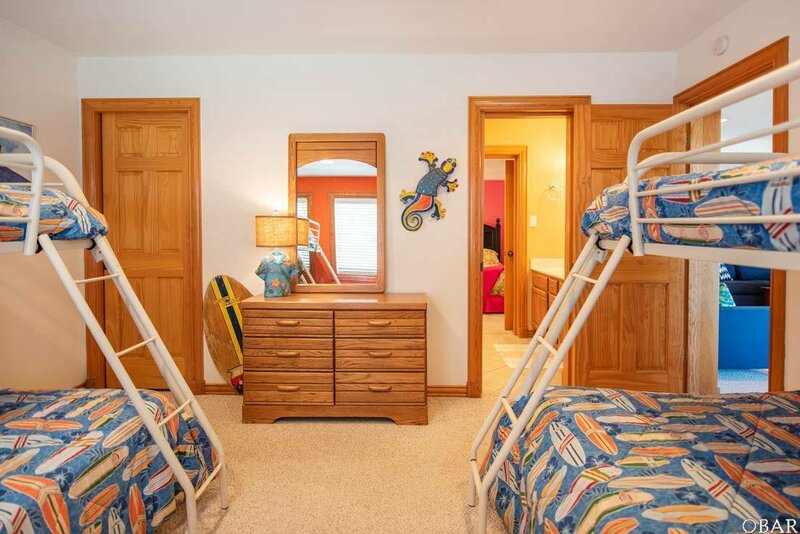 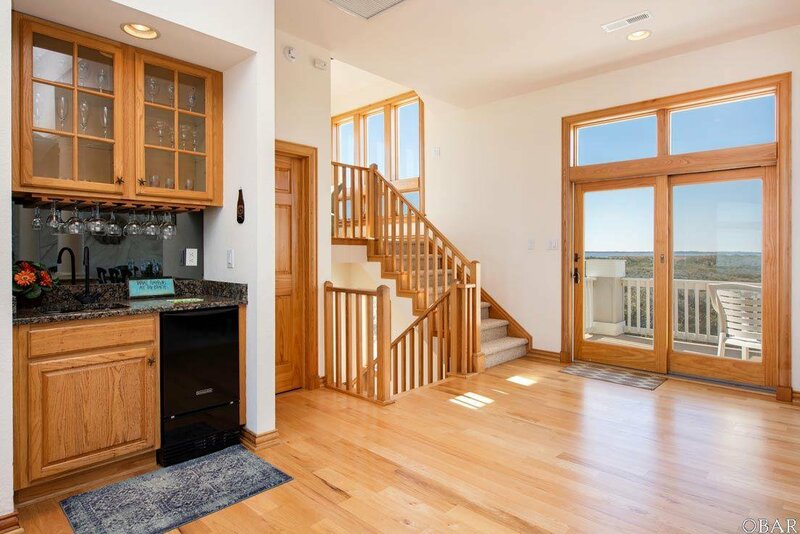 This home’s location affords guests a level of privacy that is not offered in most areas of the Outer Banks. 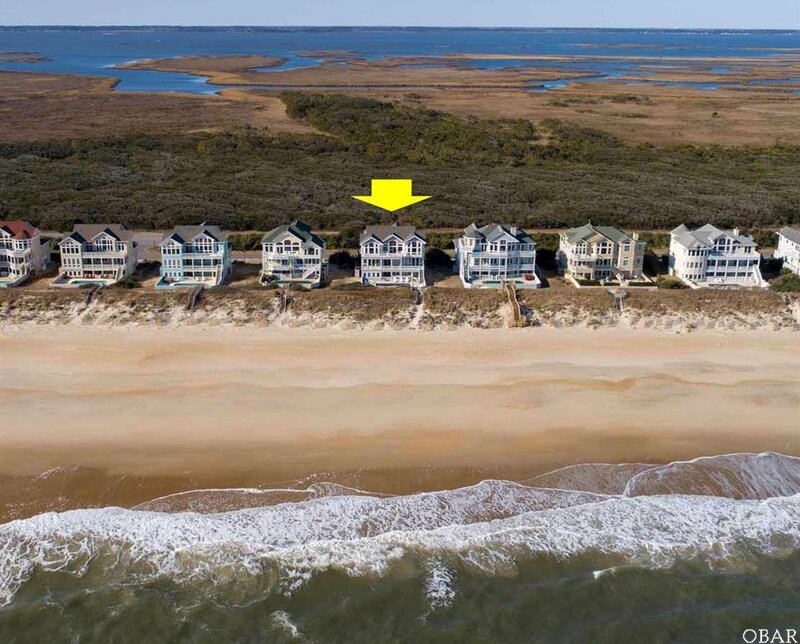 Access to the beach in this area is limited to guests staying in the southern section of Pine Island; there are no public beach accesses. 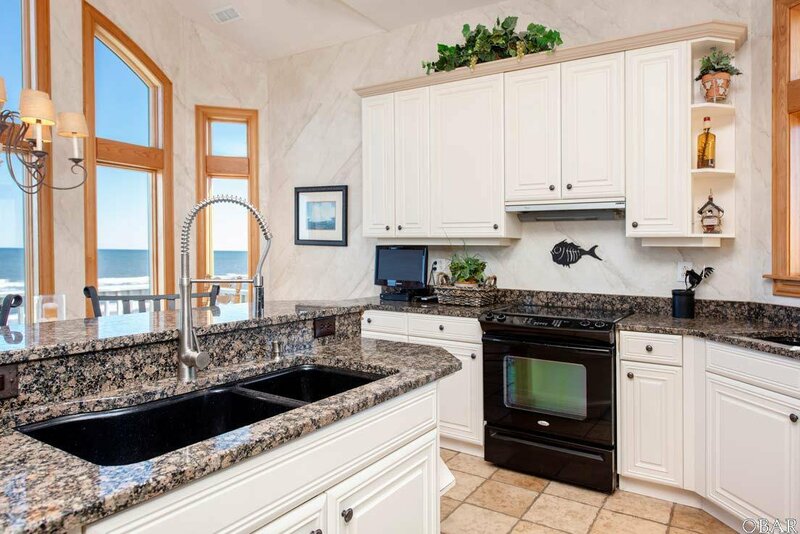 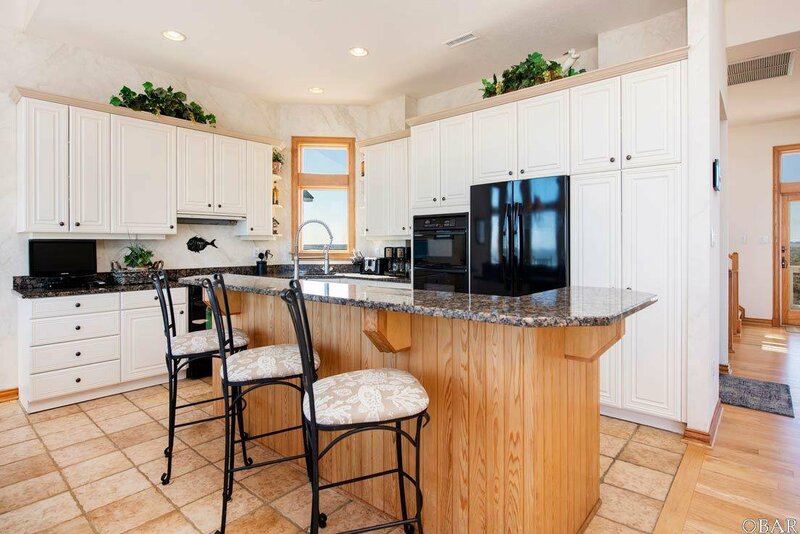 With a gourmet kitchen, two wet bars, landscaped grounds, multiple entertaining areas on three levels, large 17 x 28’ pool with pool-side bar, and private beach access, it is a once-in-a lifetime opportunity to own the perfect property for anyone who wants to maximize their enjoyment of living on the northern Outer Banks. 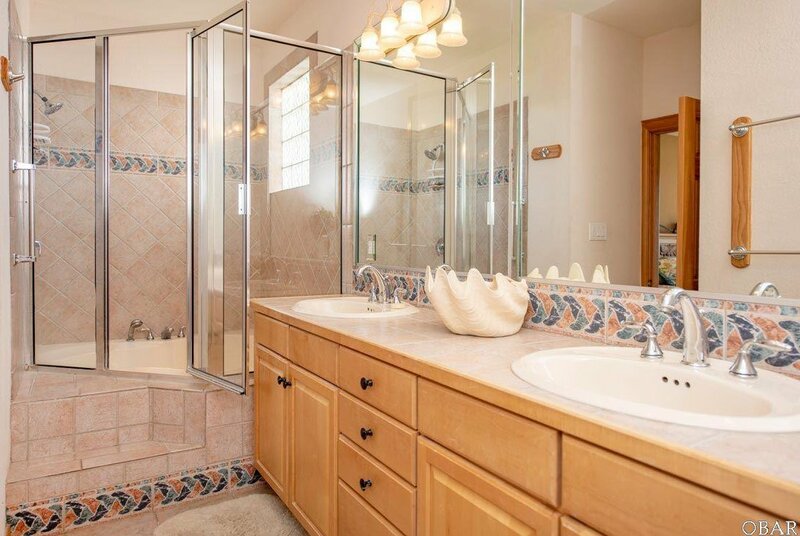 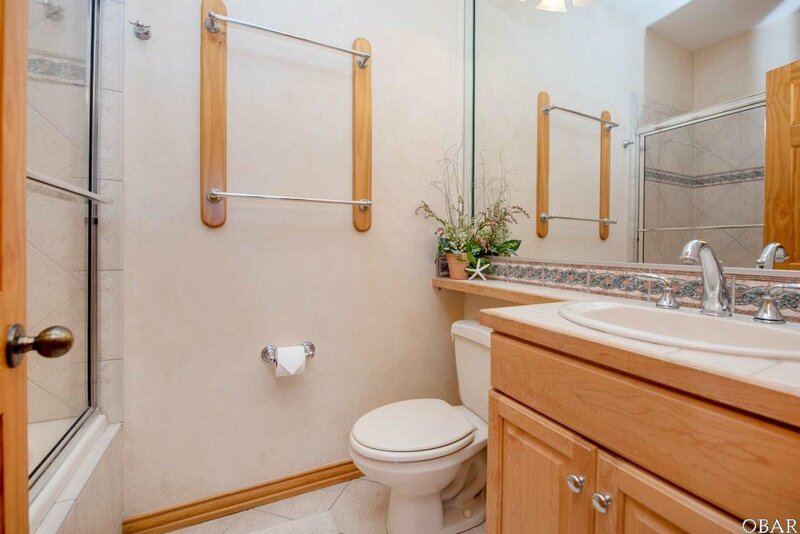 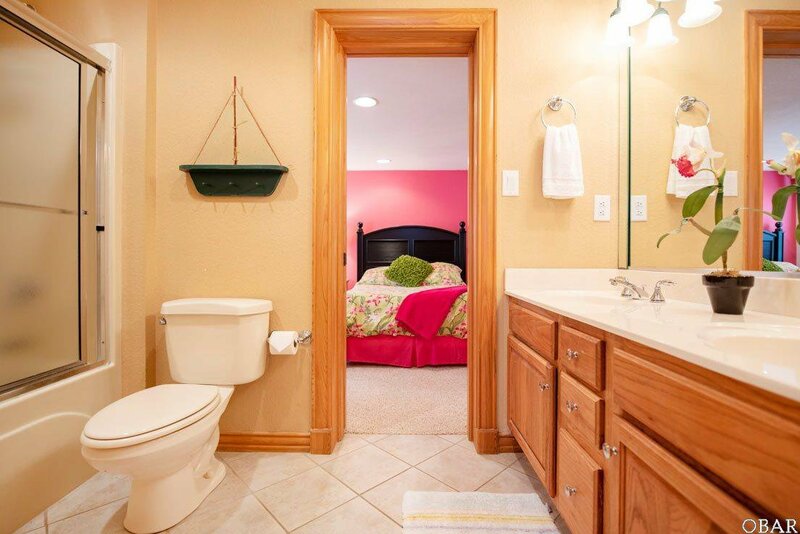 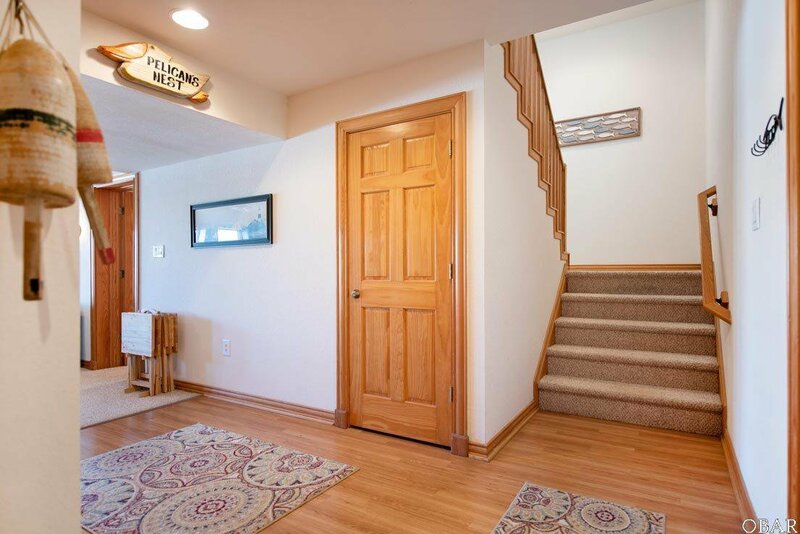 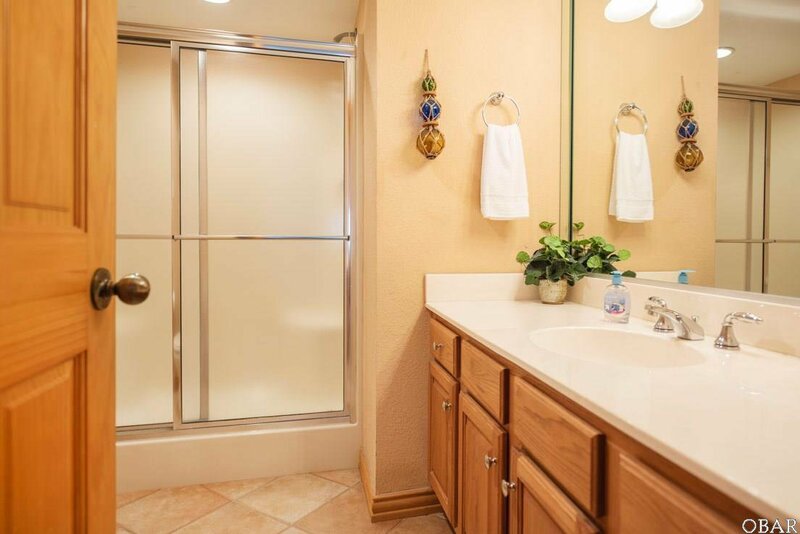 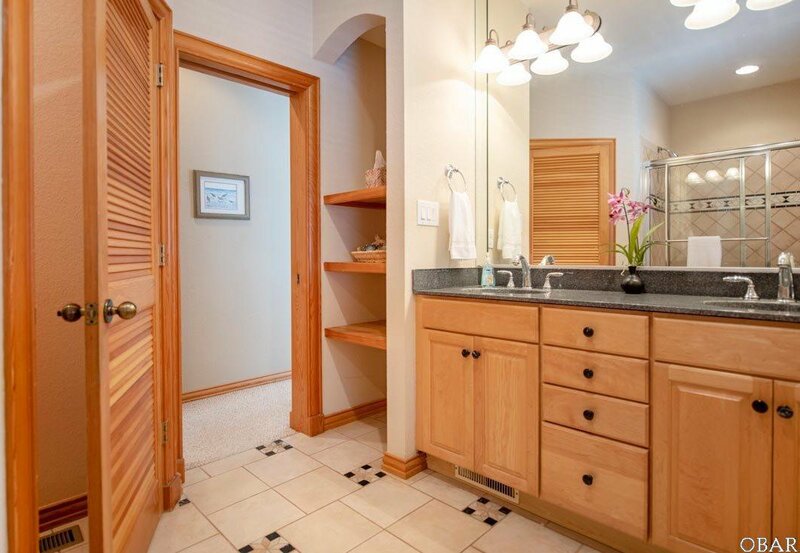 This home is impeccably maintained while being gently rented. 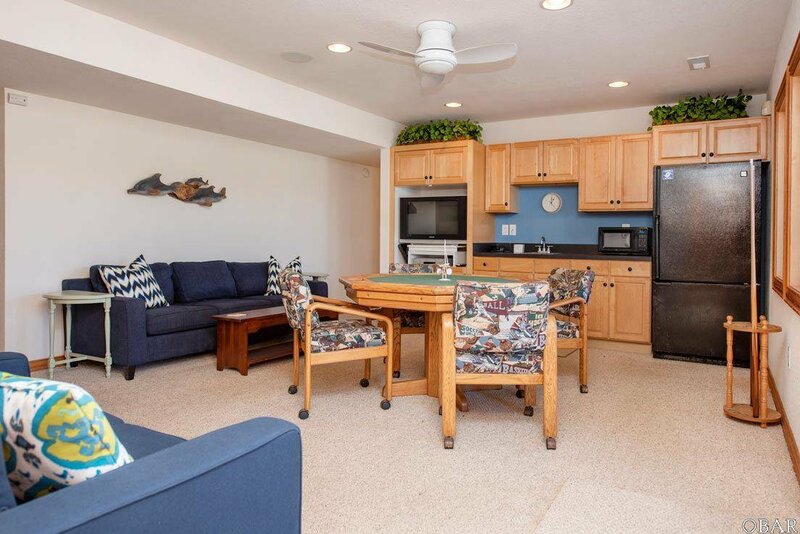 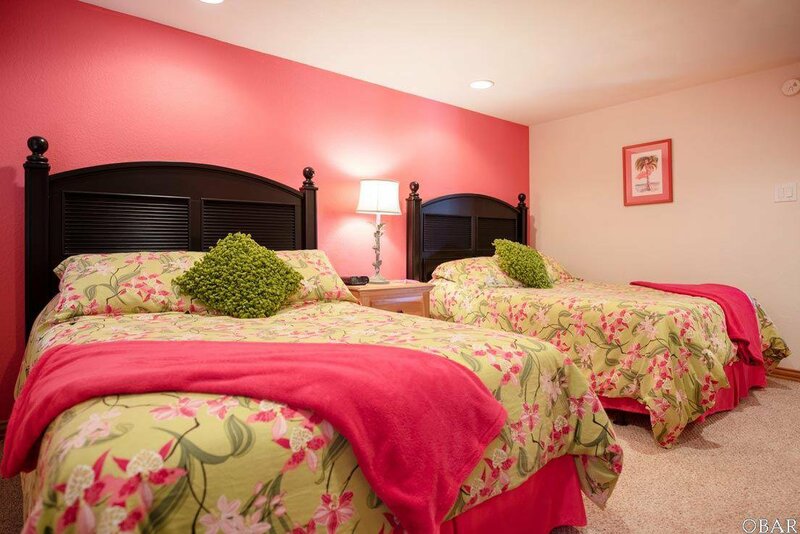 This property consistently rents from Memorial to Labor Day, grossing $137,000 annually. 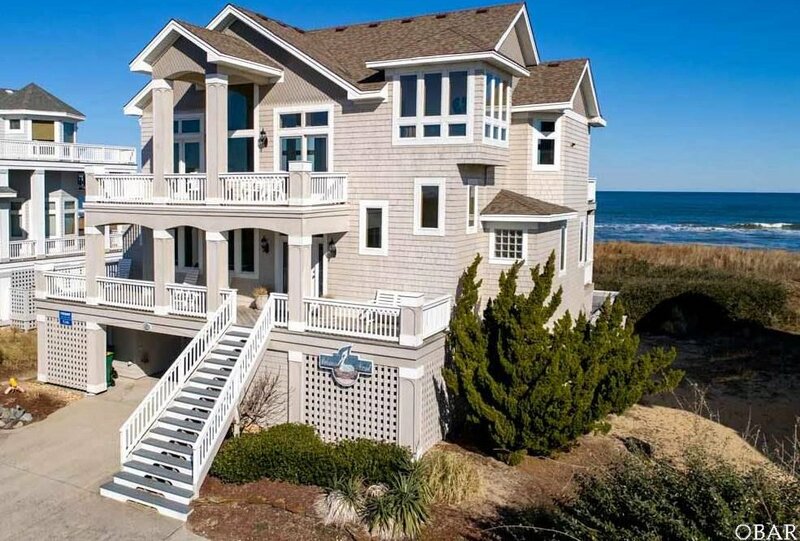 Income could be increased to $175,000 if the rental season were extended. 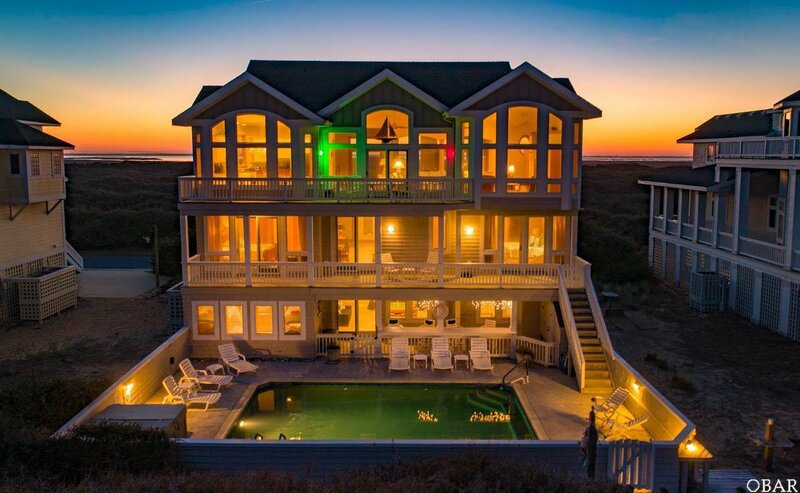 Ask for a copy of the rental projection from current management. 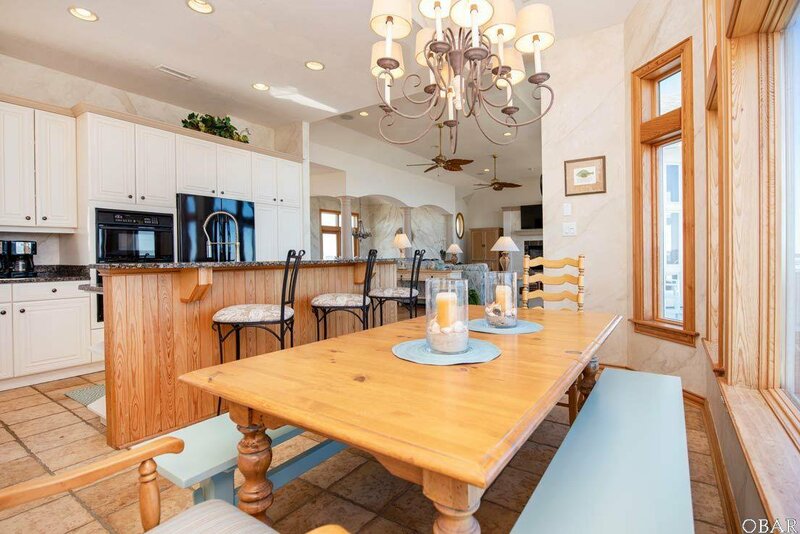 Or keep this home as the current owners have; limiting rental weeks while enjoying your own weeks here creating memories with friends and family for years to come.